Saturday, we headed out of Edinbrugh to Fort William where Gib and Cherrie and their French friends had rented a house. Of course, one can't just go straight there, you have to take a few detours! So on the way, we hit both the Falkirk Wheel and Sterling Castle. The wheel is a rather ingenious structure devised to eliminate some 18 locks to connect two of the major river ways in Scotland, and is a huge feat of modern engineering. It basically lifts boats from the lower level up to the higher level of the Union Canal that goes into Edinburgh. Really neat to watch. Needless to say Stephen and Gib were enthralled. They got to talking to one of hte river guides, who turns out used to be an engineer himself. So one thing lead to another and the guide (Stuart) took us up into the control room! From there we had lunch and then headed over to Stirling Castle, located in the town of Stirling (surprise, surprise). The oldest stoneworks date from the 12th century, with the vast majority of the existing buidlings are from the 1500s. 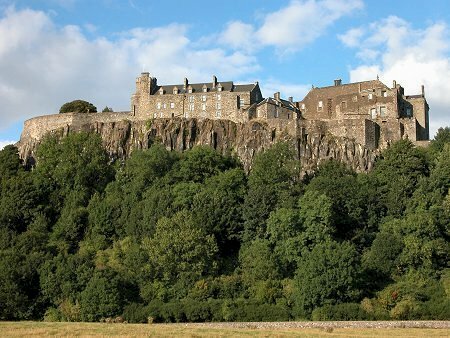 It's set up on a rocky bluff, much like Edinbrugh Castle, over looking the city of Stirling itself and much of the surrounding area. Most "castles" aren't just a single building, rather a whole complex, including Great Hall, Kitchens, Chapel, Guards' quarters, stables, etc. A small fortified city really. While we were there the great hall was undergoing excavation & refurbishment. They had just finished with the chapel, and while we were there they had a small concert, which we stayed for. Evidently the whole chapel used to be covered in frescoes, however few have survived. The reason these manged to was due to a false ceiling that was installed during the Victorian times. For the last number in the concert, they asked for a percussionist volunteer. Cherie, Gib and I all pointed at Stephen, so he was handed this beautiful stringed instrument sort of like a struck dulcimer only smaller. After, it turns out that one of the performers had actually made the instrument himself! He didn't actually know what it was, but had based it out of a design in a manuscript he had seen. Also in the chapel were two tapestries from a series that the Historians have been trying to duplicate. Turns out that they are being woven on the premises - and they had the area open so you could watch the weavers work! Needless to say, we headed over there next. From there we headed out to see the rest of the castle. We got there quite late so most of the exhibits in the other buildings had started to close. This was ok, as we enjoyed just walking around the grounds. From here we went to Fort William, which would be our base for the next few days to explore the Highlands. It's situated right on the banks of Loch Linnhe (pronounced like the female name Lynne), which lead up from sea level to the highest point in Scotland, Ben Nevis. Really beautiful country.